Pop Up Stands are the one of the most widely used back drop display stands. 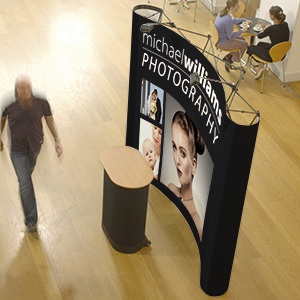 Its not hard to see why, pop up stands are easy to setup are portable and offer impressive visual impact to passers by. As a pop up stand is one of the most popular display stands we offer a number of sizes that come with a range of additions. Flat or curved we are sure that either way you will be noticed. Constructed from strong lightweight aluminium frame which is secured by magnetic locking arms. The graphic panels are stored inside the podium case and are secured to the frames by pre applied magnetic tape on the back, which once complete leave a seamless high impacting graphic visual.